Find your dream Daihatsu car today at Carsnip. We’ve got over 179 used Daihatsu vehicles available, and our intuitive search system means that you can make the best decision in the easiest way. We’ve made buying your next car easy. Browse over 179 vehicles below. Daihatsu is a Japanese carmaker which specialises in small vehicles. The Terios, introduced in 1996, has interesting looks which set it apart from others in the compact 4x4 market. 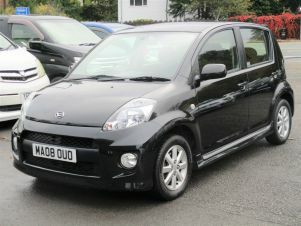 It’s a cheap, reliable vehicle, the compact size of which makes it ideal for urban driving. The Sirios could be likened to the Toyota Yaris – it’s a very small hatchback, but despite this has quite a spacious interior. Outside of family-suited vehicles, the Daihatsu Fourtrak is a simple workhorse. With very limited extras, it’s focus is on pure off-road performance, and it comes close to rivalling the Land Rover Defender. Across the range, you’ll get affordability and a compact size.